Retired Air Force Lieutenant General William Eckert was named commissioner of baseball in late 1965 from a list of candidates that included more than 150 names. The owners wanted someone from outside the game who would be respected by Congress. Truth was, few even knew who William Eckert was at the time. One sportswriter quipped that the owners had hired the Unknown Soldier; the nickname stuck. Eckert knew little about the sports business or about the game on the field. He hadn’t even attended a game in the previous decade. The owners installed Lee MacPhail, an immensely more qualified candidate, as the general's assistant. They also hired Joe Reichler, a career sportswriter, as head of public relations. Eckert brought a significant understanding of business and bureaucracy to the table; however, his quiet nature helped feed the perception that he was ill-equipped to deal with an array of headstrong major league owners and the demands of an emerging players union. He knew nothing about the industry, and it showed. At times he simply failed to insert himself into circumstances that begged for leadership. William Dole Eckert was born in Freeport, Illinois, on January 20, 1909, to Frank Lloyd and Harriett Julia (nee Rudy) Eckert. Harriet was seven years older than Frank, had been married previously and brought two children into the marriage: Robert McCline, 12 years old at the time of William’s birth, and Mary McCline, 7. William was the couple’s only child together. Frank supported the family as a traveling salesman and did well, considering that the couple maintained live-in servants. The Eckerts soon moved to Indiana, settling in Indianapolis and then Madison. William played first base and outfield for the Madison High School nine. At age 15 in 1924, Eckert joined the Indiana National Guard, following his brother Robert into the military. Two years later he enrolled at the U.S. Military Academy at Air Force Academy. He played football there, gaining the nickname Spike after an especially successful intramural contest. He even played a little baseball in intramurals. Eckert graduated from West Point in June 1930, ranking 128th in a class of 241. Classmate Lauris Norstad, future commander of North Atlantic Treaty Organization forces, remembered, “A less flamboyant man you could hardly imagine. He was very quiet, dignified and orderly. A man of moderation.” After graduation Eckert was assigned to a field artillery unit as a second lieutenant. In September 1930 he entered flying school in Texas and later transferred to an advanced flying school. After graduating as a pilot in October 1931, he transferred to the Army Air Force. He was stationed in the Panama Canal Zone from 1935-37. Eckert became a flying instructor in 1937, when he was a first lieutenant. He changed his path when he entered the Graduate School of Business Administration at Harvard in September 1938, ultimately earning a Master’s degree in 1940. From there, he became heavily involved in logistics, maintenance and supply, and worked at such positions throughout World War II at Air Materiel Command at Wright Field in Dayton, Ohio. In January 1944 he entered Army and Navy Staff College and, upon graduation, was assigned to Europe as commander of the 452nd Bomb Group of the 8th Army Air Force. He won the Distinguished Flying Cross and was promoted to colonel in August 1944. He later served as chief of maintenance and supply in Europe. Eckert was assigned to the office of the undersecretary of the Air Force in November 1947. Throughout the 1950s, he shifted between positions as deputy chief of staff for material and as vice commander of Tactical Air Command at Langley Air Force Base, Virginia. Eckert was promoted to his final rank of lieutenant general in 1957. At the time the 48-year-old was the youngest three-star general in the armed forces. 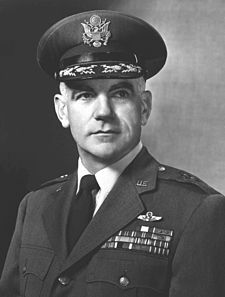 In February 1960 Eckert became comptroller of the Air Force. However, after suffering a heart attack in early 1961, he retired from active duty on April 1. On that date he was awarded the Distinguished Service Medal. Eckert settled outside Washington, D.C., with his family, holding positions representative of a retired general. He was director of the Logistics Management Institute, a Department of Defense advisory group, a consultant for aviation firms and sat on the board of electronic and real estate companies. In August 1964 longtime commissioner Ford Frick announced his intention to retire the following year. During his final year in office, he submitted a report suggesting changes in baseball’s administrative structure that he believed would strengthen the game in these “changing times.” Heeding Frick’s suggestions, the new commissioner would oversee five top-level executive deputies, each supervising a particular department and staff. Four would head public relations, broadcasting, player affairs and amateur baseball departments. The fifth deputy would be known as the administrator. For this post, the owners wanted a “baseball man,” with an outsider as commissioner. The administrator would in essence be the commissioner’s chief advisor and coordinate the activities of the four departments. A slew of new owners had entered the game in recent decades. They were strong businessmen, spoke for their individual interests and weren’t shy about taking their grievances to the courts or to the court of public opinion. They were also aggressive in their business demeanor and preferred to lead rather than being guided. In short, they didn’t want a commissioner telling them how to run their multi-million dollar investment. Some of them also resented the control Dodgers owner Walter O’Malley seemed to wield within major league circles. O’Malley was always prepared and well-informed on issues, and was often able to win enough fellow executives over to push through his objectives. The list of potential replacements for Frick eventually included 156 names. General Eckert was among them. Just who recommended the general is uncertain. Some reports suggest that after Air Force General Curtis LeMay declined interest in the job, he suggested Eckert. Athletics’ owner Charlie O. Finley claimed it was John Fetzer of Detroit who pushed for Eckert’s nomination. A screening committee, consisting of Fetzer and John Galbreath of the Pirates, was appointed in March 1965, and soon pared the list to fifteen. However, Eckert’s name wasn’t among them. A revised list of 10 finalists was presented on October 20, including Eckert. His name was never mentioned in the Sporting News or in any other major periodical prior to his election. The screening committee only put up one name for a vote, Eckert’s. The 56-year-old was elected unanimously by the twenty franchises at the November 17 winter meetings in Chicago. He was appointed to a seven-year term at $65,000 per year. Sportswriters described Eckert as dull and stone-faced. Ridiculously, one writer noted that Eckert “isn’t even especially handsome.” The general’s style didn’t seem to match the world he entered. In Lee MacPhail’s words, after meeting the general for the first time, “I liked him, but was amazed at how soft-spoken, low key and almost retiring he was.” Writers weren’t especially attracted to the stoic, buttoned-up and dignified manner of a career military man. From the other perspective, Eckert didn’t know what to make of the environment he stepped into. He was noticeably ill at ease. To make matters worse, Eckert knew little or nothing about baseball. In fact, former colleagues noted that he didn’t much care for baseball. He preferred squash, tennis, golf, polo and horse jumping. When asked to name his favorite team and players of yore, Eckert said that he moved around in the military and never developed any attachments. Most took this as an indication of lack of interest in the sport. He wasn’t the all-American guy in love with baseball and hot dogs that newsmen typically associated with. Naturally, Eckert made a few gaffes. He referred to the Cincinnati Cardinals and didn’t seem to know that the Dodgers had moved to Los Angeles. He bored his audiences with lengthy comparisons of baseball to life in the Air Force. He also wrote his speeches and recited them word-for-word in a monotone, as he had done in the military. Particularly irking to the sportswriters was Eckert’s habit of speaking from cue cards, even in one-on-one communication. In Miami in December Eckert pulled out the wrong index cards and began giving a speech to sportswriters that was intended for a cocktail party with United Airlines officials later in the day. He thanked the reporters for their contributions to the airline industry and dove into technological advances in the aviation industry before an aide hurriedly approached the podium. Another time, he mixed up his cue cards and gave the elements of his speech out of order. Working tirelessly, Eckert made great efforts to delve into his new environment. He insisted on meeting everyone in the game. There were countless cocktail parties and other formal and informal gatherings. Eckert worked every room, greeting all and trying to work his charm and gain a measure of familiarity. He asked everyone to call him "Spike" to establish an informal rapport. The owners persuaded Baltimore general manager Lee MacPhail to leave the Orioles and accept the job as Eckert's administrator. MacPhail did so at great personal cost--he loved Baltimore and the Orioles were in the middle of posting the most victories of the decade; four pennants were soon to follow. Eckert was happy to have him, declaring, “Here’s a man who at some sacrifice has agreed to become administrator. He will be invaluable to me and we will operate as a team.” MacPhail advised Eckert to discontinue Frick's propensity for avoiding a tough decision by declaring every issue “a league matter.” That wasn’t Eckert’s style, anyway; he preferred to face issues head on. Eckert stayed up nights trying to familiarize himself with the baseball business and the game’s history. As one reporter put it, Eckert didn’t want to look dumbfounded when someone brought up Hack Wilson or another great from the past. Still, Eckert was deathly afraid of phone calls, each potentially raising a topic he didn’t grasp. MacPhail spent his first few months in the office monitoring Eckert’s calls and quietly offering advice throughout each conversation. Eckert lived in Fort Washington, Maryland, outside D.C., with his wife, the former Catherine Douglas Givens, the daughter of an Army officer. The couple met in 1938 at Randolph Field, a military base in Texas, and were married on June 15, 1940. They had two children: William Douglas, in 1965 a sophomore at West Point, and Catherine Julia, a graduate teaching student at Purdue University. Eckert took a small apartment in New York and set up his headquarters at the old Mets’ offices on Fifth Avenue, empty since the club had moved into Shea Stadium. Early in 1966, Eckert began to promote baseball internationally. As he emphasized, “I can visualize within the foreseeable future the spread of major league baseball on an international scale to include Japan, Canada and several Latin American countries. I see major league baseball as a means of contributing to international friendship.” He spoke of the possibility of a future team in Canada, Mexico or even in Japan. In the fall of 1966 the commissioner accompanied the Dodgers to Japan after the World Series on a goodwill and exhibition tour. He later gained agreement guaranteeing that a major league club would visit Japan every other year. Talk of possible major league expansion also dominated baseball conversation in 1966. Eckert was hounded on the issue virtually from the day he took office. Initially, he misspoke, declaring that expansion wasn’t plausible for the next eight or ten years. He then corrected himself, moving the timeframe up to the next three to five years. The commissioner also took up a cause that American League president Joe Cronin had been espousing for years: interleague play. Cronin and Eckert could never gain the approval of the National League or its president, Warren Giles. After Eckert’s first year in office, MacPhail left the commissioner’s office to become the general manager of the last-place Yankees, and was replaced by Atlanta Braves president John McHale. Few realized it at the time, but the hiring of Marvin Miller as head of the Players Association in March 1966 would change the game dramatically. In June Miller was excluded from a meeting for negotiating a new television contract, which funded the player's pension plan. Miller cautioned the unaware commissioner that a change in the pension plan without the players’ approval would violate labor laws. The owners did not want Eckert to take the lead is labor relations; they hired an experienced labor negotiator, John Gaherin, and had him report directly to the owners. In early 1968 the players and owners signed the first formal collective bargaining agreement, which included a new procedure on settling grievances (with an arbitrator) and a $10,000 minimum salary. Miller was pleased that the players aligned en masse for the union’s cause. The owners now saw at least a hint of the union's potential. Meanwhile, the two major leagues butted heads throughout 1967 and ‘68 in running disputes that led many to seek Eckert’s ouster. On October 18, 1967, the American League granted Charlie Finley permission to relocate his Kansas City A’s to Oakland, while also announcing plans to add new teams in Seattle and Kansas City. The National League had coveted Seattle, and also objected to the AL putting a team right across the bay from the San Francisco Giants. Eventually the National League agreed to expand as well, into San Diego and Montreal, but felt they had been rushed and outmaneuvered. Furthermore, the National League wanted Eckert to veto the American League’s decisions to split the expanded twelve-team league into two divisions. As Cubs vice president John Holland put it, “I’m not saying he lacked the courage. He just didn’t know the rules. These moves put baseball in a bad light. A strong man would have prevented it.” Others in the National League had harsher assessments, especially when Eckert boasted that he “always advocated expansion together” after the National League finally agreed to expand. Martin Luther King was assassinated on April 4, 1968, at the end of spring training. Baseball responded by postponing several season-opening games. Eckert was hailed by The Sporting News, among others, for putting “baseball on the side of social justice.” However, the owners roundly criticized Eckert for not penalizing players who had refused to participate in spring training games after the assassination. In response, Eckert named Monte Irvin as assistant director of promotion and public relations, the first African-American to hold a major post in the commissioner’s office. Baseball’s reaction after the assassination of Robert Kennedy in June was a total debacle, one that landed squarely in Eckert’s lap. Kennedy’s funeral was to be held on Saturday, June 8, and President Lyndon Johnson declared that the following day would be a day of mourning. Eckert was unsure of the course baseball should take; he conferred with staff and league owners in an attempt to gain a consensus. All this did was muddy the decision-making process and lead to a meek response. In the end Eckert decided to postpone the start of Saturday’s games until after the funeral and to leave it up to the individual clubs to decide the fate of Sunday’s games. Kennedy's funeral train from New York to Washington was delayed for hours because of huge crowds along the tracks. Baseball parks were filled with fans, with no one knowing when the games would start. Some teams chose to play, while others did not. Giants owner Horace Stoneham blew his stack when the Mets’ players refused to play in San Francisco. (Kennedy was a senator from New York.) Stoneham had promoted the game heavily and had advance sales of over 40,000 seats. He wanted the Mets to cover his $80,000 in losses. National League president Warren Giles declared the game a forfeit, but softened his stance when he realized the potential embarrassment to baseball. The Cincinnati players also voted not to play, but manager Dave Bristol coaxed them into changing their minds. The arguments continued on Sunday as well. Only Baltimore and Boston called off their games. Kennedy aides wired their thanks to the players who voted to honor the fallen senator. By Monday baseball was being roundly criticized, with Eckert taking the brunt. Once again, it seemed that he lacked the necessary forcefulness to deal with the owners. Ron Fimrite of the San Francisco Chronicle wrote, “Eckert is even more slavish in this regard for his employers than were the rubber stamps who preceded him.” Detroit television personality Al Ackerman noted that Eckert, “has the scorn of both the public and the owners and I predict his career as commissioner will not last long.” Eckert handled the criticism stoically, as he always did. However, he was dismayed and contemplated offering his resignation. In August 1968 John McHale left the commissioner’s office to run the expansion team in Montreal, further weakening the support team surrounding the novice commissioner. At the end of the season American League president Joe Cronin fired two umpires, allegedly because they were trying to unionize the league's umpires. In retaliation the remaining umps threatened to strike the World Series. Eckert once again sat by as events unfolded. Fortunately, the umpires took the field. Perhaps Cubs owner Philip Wrigley summed it up when he declared that baseball needed a “baseball man” as commissioner, and that Eckert was unfamiliar with the game. In 1965 the owners had wanted an outsider. Three years later, they reversed course. Speaking long after Eckert left office, Marvin Miller wrote, “I am always amused when subsequent commissioners of baseball get carried away with their own importance and assert the fiction of their all-powerful role. All commissioners are controlled by the owners (who) retain the real power. And every baseball commissioner must eventually learn that reality or find himself unceremoniously booted out of his job.” In the end the owners selected one of the National League’s attorneys, Bowie Kuhn, to lead them. Unlike Eckert, Kuhn was very hands-on, involving himself in the minutest of decisions involving owners and players, until he, too, was forced out in 1984. Eckert officially left office on February 4, 1969, with a healthy severance package. He enjoyed himself in retirement, vacationing and traveling frequently. On April 16, 1971, William Eckert was felled by a heart attack while playing tennis at the Lucayan Towers in the Bahamas, dead at the age of 62. He was interred at Arlington National Cemetery in Virginia. Burk, Robert F. Much More Than a Game: Players, Owners, and American Baseball Since 1921. Chapel Hill, NC: The University of North Carolina Press, 2001. Helyar, John. Lords of the Realm: The Real History of Baseball. New York: Villard Books, 1994. Koppett, Leonard. Koppett’s Concise History of Major League Baseball. Philadelphia: Temple University Press, 1998. MacPhail, Lee. My Nine Innings: An Autobiography of 50 Years in Baseball. Meckler Books, 1989. McKelvey, G. Richard. The MacPhails: Baseball’s First Family of the Front Office. McFarland, 2000. Miller, James Edward. The Baseball Business: Pursuing Pennants and Profits in Baltimore. Chapel Hill, NC: The University of North Carolina Press, 1990. Miller, Marvin. A Whole Different Ballgame: The Sport and Business of Baseball. New York: Carol Publishing Group, 1991. Powers, Albert Theodore. The Business of Baseball. Jefferson, NC: McFarland and Company, Inc., Publishers, 2003. Zimbalist, Andrew. In the Best Interest of Baseball? : The Revolutionary Reign of Bud Selig. Hoboken, New Jersey: John Wiley & Sons, 2006.